German flag carrier Lufthansa is cancelling around 1,800 flights today as ground crews stage a one-day strike demanding higher wages. “This time it is a strike ... with a massive impact, completely excessive, that has only one aim - to position itself as a union at Lufthansa against many other unions and groups,” Stefan Lauer, Lufthansa’s chief personnel officer, told ARD television. 150,000 passengers are expected to be affected by the cancellations, according to Lauer. The airline grounded a total of 1,755 flights today, with only about 20 of 1,650 planned European flights and 12 of 70 planned long-haul services taking off, the airline said. 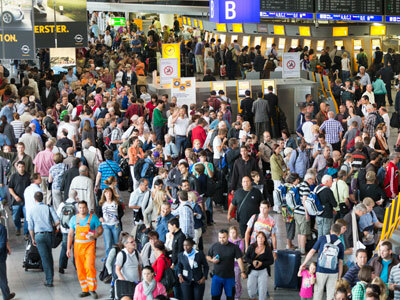 The strike is Germany’s biggest air travel disruption since April 2010, when air travel in Europe was paralyzed by the Eyjafjallajökull volcano eruption, when 100,000 flights were grounded over six days. 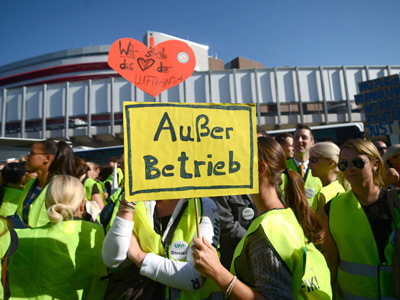 33,000 Lufthansa employees are demanding a 5.2% wage increase, compared to the 0.4-0.6% Lufthansa has offered. Their union, Verdi, is pushing for an agreement to exclude firings. Chief negotiator Christine Behle rejected Lufthansa's offer. "For employees that is a sharp reduction in real pay and in no way acceptable," said Behle. Lufthansa plans to restructure its employees to reach a higher efficiency. Europe’s second largest airline wants to lower costs and increase sales to 2.3 billion euros ($3 billion) by 2015, a plan which includes laying off 3,500 workers. The company plans to use the extra revenue to update its aging fleet. The airline preemptively cancelled 46 of Monday’s flights in anticipation of the walk out, and cancelled thousands more as technicians, service personnel, and ground crew walked off the job. Lufthansa has prioritized 6 flights to India, Dusseldorf, and the USA which will operate as scheduled. A half-day walkout on March 21 forced the airline to cancel more than 760 flights. A fourth round of talks is scheduled for April 29 and 30, and a fifth for the beginning of June. If the negotiations fail, Verdi will hold a vote on unlimited strikes, Behle said. Lufthansa-partner SAS canceled 56 flights today, expecting an abeyance in their scheduled flights as a result of the strike. Last September, a strike by cabin crew caused the airline to cancel 1,000 flights. 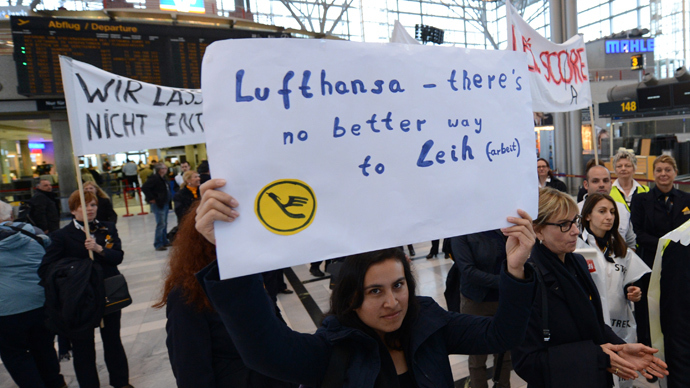 On February 22, 2010, a pilot strike stopped two-thirds of Lufthansa's Frankfurt connections. Customers travelling inside of Germany can exchange their air tickets for rail-travel vouchers. Germany’s rail authority said it will add extra train services today. Lufthansa hasn’t yet released damages figures as its unknown how many passengers will rebook, cancel, need hotel accommodation, and other stranded person expenses. When Qantas airline in Australia was grounded for an entire day in 2011, it cost more than $100 million. Los Angeles and New York City airports were also backed up after 15,000 air traffic controllers were made redundant due to government spending cuts.